An ARTS FESTIVAL is a festival that features the arts in a wide sense of the word not just visual arts. Festivals of visual arts are not to be confused with the commercial art fair. Artists participate in the most important of such festival exhibitions by invitation, and these exhibitions (e.g. the Venice Biennale) are organised by internationally recognized curators chosen by a committee of peers. These international exhibitions must also be distinguished from art fairs, market-oriented gatherings of art dealers and their wares, which have recently emerged as among the most important art-world venues for promoting artists and sales of contemporary art in the present-day super-heated art market. An ART EXHIBITION is traditionally the space in which art objects (in the most general sense) meet an audience. The exhibit is universally understood to be for some temporary period unless, as is rarely true, it is stated to be a "permanent exhibition". In American English, they may be called "exhibit", "exposition" (the French word) or "show". In UK English, they are always called "exhibitions" or "shows", and an individual item in the show is an "exhibit". Such expositions may present pictures, drawings, video, sound, installation, performance, interactive art, new media art or sculptures by individual artists, groups of artists or collections of a specific form of art. The art works may be presented in museums, art halls, art clubs or private art galleries, or at some place the principal business of which is not the display or sale of art, such as a coffeehouse. An important distinction is noted between those exhibits where some or all of the works are for sale, normally in private art galleries, and those where they are not. Sometimes the event is organized on a specific occasion, like a birthday, anniversary or commemoration. BIENNALE is Italian for "biennial" or "every other year" and can be used to describe any event that happens every two years. It is most commonly used within the art world to describe large-scale international contemporary art exhibitions, stemming from the use of the phrase for the Venice Biennale, which was first held in 1895. The phrase has since been used for other artistic events, such as the "Biennale de Paris", or even as a portmanteau as with Berlinale (for the Berlin International Film Festival) and Viennale (for Vienna's international film festival). "Biennale" is therefore used as a general term for other recurrent international events (such as triennials, Documenta, Skulptur Projekte Münster). At Art Basel, a Powerful Jury Controls the Market - The New York Times. How to Build an Art Fair - The New York Times. How to Make an Art Fair Part of Your Next Vacation - The New York Times. Leading Art Fairs around the world - MutualArt.com. TEFAF Art Market Report 2018 - "The global art market, with a focus on the US and China." Top 50 Art Fairs in the U.S. - Artsy Shark. Which International Art Fairs Have the Highest Attendance? - ARTnews. World’s 10 Best Art Fairs - since 1936. "Fodor's Travel Guide. Affordable Art Fair - since 1999. International, contemporary art fair held in different cities around the world. ARCO Madrid - International Contemporary Art Fair. Since 1982. 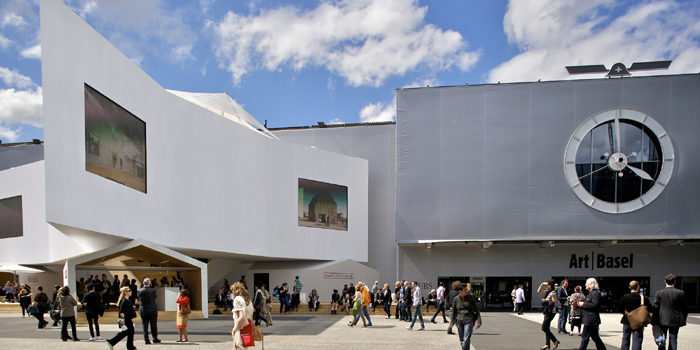 One of Europe's leading and popular art fairs. In addition to the exhibiting galleries, a series of lectures and specially focused exhibitions take place. Madrid, Spain. ARS ELECTRONICA - since 1979. Based in Linz, Austria and founded in 1979. Festival for art, technology and society. ART | BASEL - since 1970. The premier international art show of its kind for Modern and contemporary works, bringing over 300 leading galleries from around the world to the heart of Europe. The exhibition includes the highest-quality paintings, sculptures, drawings, installations, photographs, video and editioned works. Art Basel | Hong Kong - the newest Art Basel show. With half of the participating galleries coming from Asia and Asia-Pacific, Art Basel in Hong Kong assumes a significant role in the international artworld, providing a portal to the region's artists. The new show gives galleries from around the world a platform in Asia to demonstrate the way they work with artists, and bring their highest quality work to Hong Kong. Art Basel | Miami Beach - since 2002. The favorite winter meeting place for the international artworld. At the nexus of North America and Latin America, this Art Basel show presents artwork from across the globe. Over 250 of the world's leading galleries participate, drawing over 70,000 visitors each year. Art Cologne - "ART COLOGNE is an art fair for international art galleries presenting art of the 20th and 21st centuries in Cologne, Germany. It is the oldest fair of its kind having started with just 18 galleries in 1967. Today around 200 commercial galleries come together each spring to present works by over 2.000 artists, covering all price segments from well-known blue-chip artists to the newest young and emerging artists." ART DUBAI - since 2006. The leading international art fair in the MENASA (Middle East/North Africa/South Asia), has become a cornerstone of the region’s booming contemporary art community. 8th Art Monaco 2018 - September 27-30. "Where Art Meets Glamour." Monaco's Premier Art Event. International modern & contemporary art fair. The international art fair that brings together art collectors, galleries & art lovers from all over the world. Venue: Espace Fontvieille, SAM Monte-Carlo Festivals, 5 Avenue des Ligures. Art Rio - "ArtRio is the main endeavor of BEX, producer of cultural events specialized in the visual arts. BEX was founded in 2009, by Brenda Valansi, Elisangela Valadares, Alexandre Accioly dissemination and distribution of Brazilian art within and beyond Brazil’s borders." artissima - "Artissima is Italy’s most important contemporary art fair. Since its establishment in 1994, it has combined the presence of an international market with a focus on experimentation and research. Nearly two hundred galleries from around the world participate every year. In addition to the fair, Artissima is also composed of four art sections, headed by a board of international curators and museum directors, devoted to emerging artists, drawings and rediscovering the great pioneers of contemporary art, and to the sound projects (new section)." Copenhagen Art Week - since 2013. Focuses on the best on Denmark’s art scene, and the quality of its art institutions and galleries. documenta - since 1955. Exhibition of modern and contemporary art which takes place every five years in Kassel, Germany. FIAC | Foire Internationale d'Art Contemporain - since 1974. One of the world's foremost contemporary-art events. Venue: Grand Palais, 3 Avenue du Général Eisenhower, 75008 Paris, France. FRIEZE ART FAIR London - since 2003. One of the world's leading contemporary art fairs, taking place each October in Regent's Park, London, U.K.
India Art Fair - since 2008. South Asia’s leading art fair for modern and contemporary art from across the world. New Delhi, India. Istanbul Biennial - contemporary art exhibition, held every two years in Istanbul, Turkey, since 1987. LA BIENNALE DI VENEZIA - since 1895. Major contemporary art exhibition that takes place once every two years (in odd years) in Venice, Italy. The first Biennale was held in 1895. Paris Internationale - since 2015. Gallery initiated contemporary art fair held within a hotel particulier in the heart of Paris. PARIS PHOTO | Foire internationale de photographie d'art - since 1997. The largest international art fair dedicated to the photographic medium and is held each November at the historic Grand Palais in Paris. Rencontres d'Arles - since 1970. (Formerly called Les Rencontres internationales de la photographie d'Arles) is an annual summer photography festival founded in 1970 by the Arles photographer Lucien Clergue, the writer Michel Tournier and the historian Jean-Maurice Rouquette. Salon Point Art Monaco - Sporting d'Hiver, Place du Casino, Monte-Carlo, MC 98000 Monaco. Scope Art Show - since 2000. "With over 50 art shows spanning more than a decade, SCOPE has solidified its position as the premier showcase for international emerging contemporary art and multi-disciplinary creative programming. SCOPE’s extensive reach enables an unrivaled opportunity for networking with art patrons, creative professionals and a culturally relevant public audience. Renowned for presenting the most innovative galleries, artists and curators, SCOPE Art Shows in Miami, Basel, New York, London and the Hamptons have garnered extensive critical acclaim, with sales of over $700 million and attendance of over 1,000,000 visitors." TEFAF MAASTRICHT | The European Fine Art Fair - "Established in 1988, TEFAF is widely regarded as the world’s pre-eminent organization of fine art, antiques, and design. TEFAF runs three Fairs internationally - TEFAF Maastricht, which covers 7,000 years of art history; TEFAF New York Spring, focused on modern and contemporary art & design; and TEFAF New York Fall, covering fine and decorative art from antiquity to 1920. TEFAF champions the finest quality art from across the ages by creating a community of the world’s top art dealers and experts to inspire lovers and buyers of art everywhere." The Armory Show - since 2000. "Staged on Piers 92 & 94, The Armory Show features leading international galleries, innovative artist commissions, and dynamic public programs." Leading international contemporary and modern art fair and one of the most important annual art events in New York, takes place every March on Piers 92 & 94 in central Manhattan. The Armory Show is devoted to showcasing the most important artworks of the 20th and 21st centuries. Volta - since 2005. Basel's renowned platform for presenting the vision of contemporary art galleries of global prestige whose artists represent new and relevant positions for curators and collectors alike. Basel, Switzerland. Volta NY - since 2008. Invitational show of emerging solo artists’ projects and the American incarnation of the successful young fair founded in Basel. SoHo, New York, U.S.A.